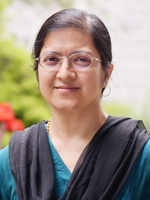 Rupa Chanda is a Professor of Economics and Social Sciences at the Indian Institute of Management (IIM), Bangalore, with a PhD in Eco­nomics from Columbia University, New York. Earlier, she worked as an Economist at the International Monetary Fund (IMF) in Washington, DC. Her research interests include the WTO, international trade in services, regional integration, health services and migration. She has undertaken research assignments for various international and Indian organisa­tions, including the World Health Organization (WHO), United Nations Development Programme (UNDP), OECD, European Commission, World Bank and ICRIER. She has coordinated a research project on India–EU mobility in collaboration with the European and Indian insti­tutions. Professor Chanda has served on several committees including the Ministry of Commerce’s Expert Group on Services, the Ministry of Overseas Indian Affairs’ Academic Working Group on India–EU Labour Mobility Partnership and the Planning Commission’s High-Level Group on Services. She has written three books and edited one book on India’s trade in services and one book on India-EU mobility. She has presented her work in national and international forums.